Although pigs are among the most intelligent animals and pork is the most consumed meat in the world, the lives and deaths of pigs in factory farms remain invisible to consumers. ProVeg takes a look at the social lives of pigs and the practices of pig farms and draws attention to delicious alternatives to pork. Sows are loving and caring mothers. Under natural conditions, towards the end of her four-month pregnancy, a sow will collect a variety of materials in order to build a nest for her young.10Report of the Scientific Veterinary Committee (1997): The Welfare of Intensively Kept Pigs. European Commission. Available at https://ec.europa.eu/food/sites/food/files/animals/docs/aw_arch_1997_intensively_kept_pigs_en.pdf [03.03.2018] 11Gundlach, H. (1968) Brutfürsorge, Brutpflege, Verhaltensontogenese und Tagesperiodik beim Europäischen Wildschwein ( Sus Scrofa, L.). Z Tierpsychol 25: 955-995. Mother sows are highly attentive and protective of their offspring. When their piglets start wandering out of sight, the mothers call out to them continuously in order to stay in contact. Piglets spend hours playing with each other, and even adult pigs display similar playful behaviour. Contrary to popular belief, pigs are tidy individuals and have strictly separated areas for sleeping, eating, and defecating. Because their extremities are not made for grooming, they groom each other and rub themselves against suitable objects such as tree stumps. Pigs do not sweat, which is why they like to swim or cool off with a mud bath.12Report of the Scientific Veterinary Committee (1997): The Welfare of Intensively Kept Pigs. European Commission. Available at https://ec.europa.eu/food/sites/food/files/animals/docs/aw_arch_1997_intensively_kept_pigs_en.pdf [03.03.2018] A coat of dried mud also protects their skin from sunburn and insects. 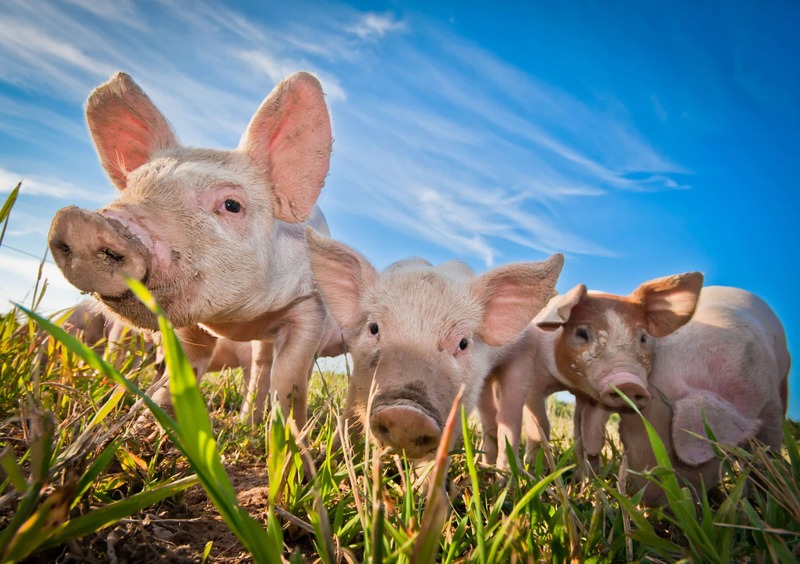 About 1 billion pigs currently live on commercial farms around the world. China, the United States, and Germany are among the world’s top pork producers.13Food and Agriculture Organization of the United Nations (2017). FAOSTAT Statistics Database. Available at http://www.fao.org/faostat/en/#data/QA [03.03.2018] Both male and female pigs are fed until their ‘carcass weight’ reaches 110 to 125 kg – usually within six months.14Bundesanstalt für Landwirtschaft und Ernährung: Wann ist ein Schwein schlachtreif? Online unter https://www.ble.de/DE/BZL/Kennen-Sie-Landwirtschaft/Tier-Stall/Schwein-Schlachtreif.html?nn=9123528 [03.03.2018] 15Bayerische Landesanstalt für Landwirtschaft. Optimales Mastendgewicht bei Schweinen – Biologische Leistungen. Available at https://www.lfl.bayern.de/mam/cms07/ite/dateien/36201_optimale_mastendgewicht.pdf This rapid growth is due mainly to three factors: their movement is severely restricted, they are fed calorie-dense foods, and they are selectively bred to grow as fast as possible, all of which impact negatively on their health. Pigs in European factory farms spend their entire lives in a space that is smaller than a square metre,16Council Directive 2008/120/EC of 18 December 2008 laying down minimum standards for the protection of pigs barely enough room to turn around or lie down. They are kept on concrete floors, with slatted crevices allowing faeces and urine to pass through. They are typically fed a soya-based diet which is designed solely to increase their weight, rather than to provide nutrition appropriate to the pigs’ physiology. Roughly 75% of the global soya bean harvest is fed to so-called ‘livestock’. The soya beans are predominantly farmed in the US, Brazil, and Argentina.17Brack, D., A. Glover & L. Wellesley (2016): Agricultural Commodity Supply Chains Trade, Consumption and Deforestation. Chatham House, London About 80% of global soya farmland is used to grow genetically modified soya beans.18ISAAA (2016): Global Status of Commercialized Biotech/ GM Crops: 2016. Available at http://www.isaaa.org/resources/publications/briefs/52/download/isaaa-brief-52-2016.pdf [03.03.2018] On Europe’s organic farms, pigs fare only slightly better: They are allowed 1.3 m² of indoor space and an additional 1 m² outdoors, which is usually a concrete floor sparsely covered with straw.19Commission Regulation (EC) No 889/2008 of 5 September 2008 laying down detailed rules for the implementation of Council Regulation (EC) No 834/2007 on organic production and labelling of organic products with regard to organic production, labelling and control Compared to a natural environment, conditions on industrial farms offer little external stimulus for the pigs. Because their natural inquisitiveness is met with sensory deprivation, pigs in these conditions often become so stressed that they are driven to cannibalism of their group-mates. For at least one month during the ‘insemination phase’, sows are kept separate from their fellow pigs in so-called gestation crates. These crates are just slightly larger than the sows themselves. Afterwards, they are returned to the group, but regulations allow for them to be kept in further isolation. Shortly after birth, piglets endure several mutilation procedures, usually performed without anaesthetic. Among the most painful of these are castration, tail docking, and the grinding down of their teeth. All these procedures are necessitated by the unnatural and severely restrictive husbandry conditions that are used in industrial pig farming. After about 18 weeks of fattening, at just six months old, the pigs are loaded onto overcrowded trucks and transported long distances to be slaughtered. At the slaughterhouse, a gas or electric shock is administered to render the pigs unconscious before killing. In Germany, the failure rate for stunning is 12%, and in the UK it is as high as 20%.26Spiegel Online (2012): Regierung rügt Tierquälerei in Schlachthöfen. Available at: http://www.spiegel.de/wissenschaft/natur/schlachthoefe-arbeiten-mit-hoher-fehlerquote-tiere-leiden-unnoetig-a-840156.html [03.03.2018] 27Anil, M.H. & McKinstry, J.L. (1993). Results of a survey of pig abattoirs in England & Wales. London: MAFF Meat Hygiene Division. Reciprocation In these cases, pigs consciously experience their throats being slit and are left to bleed out. A small percentage remain conscious past this point, and can then feel their bodies being lowered into scalding 60°C water. Almost 1.5 billion pigs are bred, fattened, and slaughtered every year. Globally, pork is one of the most consumed meats. In 2013, the average person ate approximately 16 kg of pork. In the US, the per capita consumption is 28 kg, while in Europe, it is 39 kg.28Food and Agriculture Organization of the United Nations (2017). FAOSTAT Statistics Database. Available at http://www.fao.org/faostat/en/#data/FBS [03.03.2018] Plant-based alternatives to pork have a positive impact on both the environment and our health. Regularly occurring food scandals such as swine flu and rotten meat, and the increasing occurrence of multidrug-resistant pathogens, exacerbated by the high use of antibiotics, are just a few examples of the health risks that animal-based foods can pose. Meat consumption is also a risk factor for diseases of the cardiovascular system. A US study, with more than 500,000 participants, showed that, compared to people consuming the least meat, men with the highest meat consumption were 27% more likely to die of cardiovascular disease, whereas for women the risk was elevated by 50%.29Sinha R, Cross AJ, Graubard BI, Leitzmann MF, Schatzkin A (2009): Meat intake and mortality: a prospective study of over half a million people. Arch Intern Med 169 (6), 562-71 The more red and processed meat that was eaten, the greater the risk became. More and more consumers are questioning the consumption of meat and the effects that our diets have on animals, the environment, and our health. This is also reflected in the increasing demand for meat substitutes. All well-known supermarkets now offer a wide range of plant-based burgers, sausages, and more, based on legumes, vegetables, cereals, and other ingredients. Meat alternatives offer several advantages compared to meat. Vegan versions of burgers, for example, are free of cholesterol und usually contain fewer calories and less fat than similar burgers made from meat. ProVeg presents the best plant-based meat alternatives. ProVeg does not only point out healthy, cruelty-free alternatives, but also makes them more readily available. In 2011, ProVeg provided the idea for VeggieWorld – Europe’s first and biggest trade fair promoting a plant-based lifestyle – and continues to help the event organisers with the core programme and the selection of exhibitors. Furthermore, ProVeg advises and supports innovative companies that want to enrich the veggie market with their products. 7. ↑ Broom, D. M., H. Sena & K. L. Moynihan (2009): Pigs Learn What a Mirror Image Represents and Use It to Obtain Information. Animal Behaviour 78, no. 5 (November 2009): 1037–41. doi:10.1016/j.anbehav.2009.07.027. 8. ↑ Marino, L. & C. M. Colvin (2015): Thinking Pigs: A Comparative Review of Cognition, Emotion, and Personality in. International Journal of Comparative Psychology 28, no. 1 (January 1, 2015). http://escholarship.org/uc/item/8sx4s79c. 11. ↑ Gundlach, H. (1968) Brutfürsorge, Brutpflege, Verhaltensontogenese und Tagesperiodik beim Europäischen Wildschwein ( Sus Scrofa, L.). Z Tierpsychol 25: 955-995. 23. ↑ Simonsen, H.B., L. Klinken & E. Bindseil (1991): Histopathology of Intact and Docked Pigtails. British Veterinary Journal 147, no. 5 (September 1991): 407–12. doi:10.1016/0007-1935(91)90082-X.